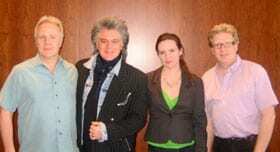 Country music renaissance man Marty Stuart has signed with Sugar Hill Records and is set to release a new studio album this summer. Stuart and the famed independent label have a history together that dates back 27 years, when his first solo album, Busy Bee Café, came out on the label in 1982. With a music career spanning nearly 40 years, the Grammy-winner is going full steam ahead with the upcoming release of his 14th studio album, new episodes of the highly rated Marty Stuart Show airing now on RFD-TV and a new tour on the horizon.